An insider's guide to tipping. One of my favorite things is the restaurant receipt that has the 15 percent, 18 percent, and 20 percent tip amounts printed on the bottom. 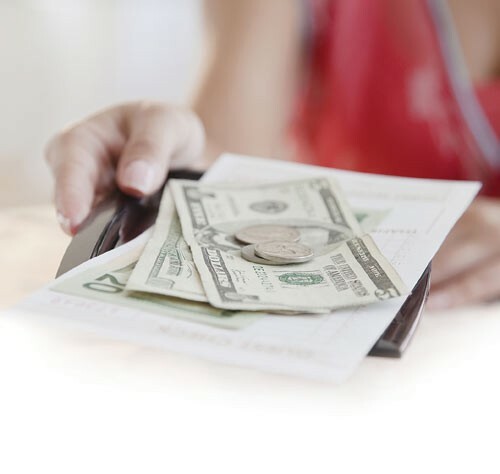 It provides a quick and easy way to figure out exactly how much to tip. On the other hand, I'm not so fond of the gray area surrounding counter service and their leering tip jars. I always wonder how much I should tip, if at all. To get a handle on what's appropriate, I talked to some restaurant insiders and frequent diners. It's no secret that people who have worked in the restaurant business are usually the best tippers. Margot McNeeley, the executive director of Project Green Fork, has waited tables and tended bar. "It's not easy work," she says. "I almost always tip 20 percent, if not more, unless the server is rude. If they're in the weeds and super busy but nice about not being as attentive, I still tip well." Stephen Hassinger, the innkeeper at the Inn at Hunt Phelan, is also a chef with many years of restaurant experience. "Me, I tip everybody," he says. This includes the dry cleaner ($10 every once in a while), the guy at the car wash who wipes the rims ($3 to $5), and the barista ($1 every time and $3 to $5 sometimes). "Basically anyone who performs any kind of service, I tip $1 to $20 depending on how much work it is and whether I plan on returning," he says. Hassinger believes that once you add some decent gratuity, that person will remember you and how you like your coffee or whether you like medium or light starch in your shirts ... whatever. "As a rule, over-tip in the beginning, and you will receive good service from that point on," he advises. Ken Lumpkin, the chef/owner of Umai, wants people to understand that servers get paid very little and survive on tips. (The norm for servers' wages is $2.13 per hour.) "I know that 15 percent is the standard, but it has not kept up with the increased cost of living," Lumpkin says. "Tipping should start at 18 percent." He agrees that receiving poor service is cause for a smaller tip but suggests that diners take into consideration whether or not it was a server's error or someone else's. "Servers have to deal with backed-up kitchens, angry cooks, angry patrons, running out of supplies, co-workers' attitudes, etc.," he says, suggesting that if a patron is dissatisfied, it's better to alert the manager to the problems instead of stiffing the wait staff. Ben Vaughn is the chef/owner of Grace Restaurant, which offers fine dining. He says that 18 percent is the average tip. However, Wally Joe, the chef at the Brushmark, says that 20 percent should be the standard for fine dining. "Service is more refined, and extra attention is required and expected," he says, noting that there may be small touches such as tableside serving of sauces and beverages. "A server should also have full knowledge of the menu and wine list," he adds. Joe is very outspoken when it comes to counter service and says that tip jars really annoy him. "What am I suppose to tip them on? Handing me my order that they are paid to do? That requires no effort at all," he says, equating it to a clerk handing him a pack of gum at a convenience store. Helario "Harry" Reyna, who owns Elliott's, a sandwich and burger joint downtown, says the standard tip for counter and pick-up orders is 10 percent. Elliott's has never had a tip jar, but patrons may choose to leave a tip on the table. When Reyna was part-owner of Kwik Chek on Madison, they had a tip jar and split the tips. "That's how I started a savings account for my daughter," he says. Elizabeth Blondis, part-owner of Central BBQ, recommends 5 to 10 percent for counter service and to-go orders. The tips are put into a pool for all employees and divided based on total hours. "That way, everyone — from the prep cook to the busser and everyone in between — shares in the rewards of doing a good job and working as a team," she says. Blondis notes that no one at Central is paid less than minimum wage (most are paid more), but the additional tips can add up to an extra 50 cents to $1 per hour for employees. Vaughn says that the staff at Au Fond, his market and cafe adjacent to Grace which offers counter service, is paid a higher rate than the wait staff at Grace. "It's a nice thing to leave a buck or two to the guys and girls cleaning up and working their butts off, but it's not expected," he says. Gary Bridgman, a former waiter who "carried trayloads of plates/drinks and tracked customer satisfaction throughout the meal," says he has to be impressed before giving a counter tip higher than a quarter. "I'm more likely to slip a dollar under a dirty dish/tray if I'm not expected to bus my own table," he says. It's important to consider whether your to-go order is being packed up by counter staff making minimum wage or by wait staff making $2.13 an hour. Former restaurant staffer Lauri Smith points out that to-go orders were included in her total amount of sales that she had to pay taxes on. In other words, the server has to pay tax on it whether you tip or not. If the restaurants do not report it accurately, the restaurant and the wait staff get audited by the IRS. "The people putting together to-go orders [in restaurants] almost always get ripped off," McNeeley says. "Think about this: They take time, sometimes away from their stations, to put the order together, check it, bag it, ring it up." Tipping at least a few bucks on to-go orders should be required in her opinion. At the very least, it is always appreciated. So what about alcohol? Joe does disagree with his servers when it comes to tipping on wine. "I'm probably not going to make any friends among servers for saying this, but there is a feeling that they deserve to be fully tipped 20 percent on expensive bottles of wine," he says. Joe explains that whether the bottle of wine costs $200 or $30, the work is the same. Ben Carter, author of the popular blog Benito's Wine Reviews, says wine should be tipped 20 percent just like everything else. "The only time this becomes a real issue or argument is when you're spending $500-plus on wine at a single dinner. And even then, there's a big difference between 10 $50 bottles and one $500 bottle," he says. The former is going to involve a lot of work and glasses and surely deserves 20 percent, in his opinion, and for the latter, he believes 10 percent might be appropriate without throwing off the overall balance of the bill. When it comes down to it, customers need to be aware of the nuances involved in the restaurant business and what constitutes good service. Hassinger sums it up: "Employees who work for tips appreciate someone who appreciates them."